Boos Mummy: Rainy Days are gone! 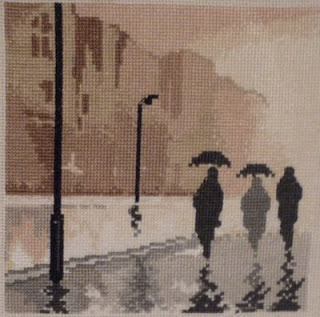 Yes don't faint but the Rainy Days silhouette is actually finished. I cannot believe how long this one project has taken, the last silhouette I did was completed fast. Stayed up late Friday night to finish it off, didn't want to go to bed when there was only a few odd stitches and bit of backstitching to do. I'm pleased with how it turned out. That's another UFO that has gone into the finished pile. The UFO pile is still bigger than I'd like but I'm getting there now. Look out ASAW sal because you're next for working on! Going to Hobbycraft this Sunday to pick up a couple of bits I want for it. Only got 2 small motifs to do on my sons Thank You biscornu for his teacher so need to buy some filling as well as mine is all gone. These are the 2 bags I made for my sons to use in the car when travelling. Put Sully from Monsters Inc on Peters as he loves that film. Luke is a big Winnie the Pooh fan so he got Tigger. As you can see they're already a hit. They've got their favourite books inside with some cars and trains and take them up to bed (like their bedroom isn't already awash with toys!) I've got some t-shirt transfers with fabric paints, during their summer holidays they can paint a picture and I'll put it on their bags rather than a t-shirt just so they can personalise them a bit. I also made one for Peters school friend Thomas as it was his birthday last week. I cross stitched his name on his and also bought him a transfer paint kit. His mum says she'll put his travel toys in it for their holiday...they went Saturday so happy holidays guys. Now both my sons friends want one for their day trips.....better start them soon! Well done on your finish - it's such a nice feeling .. love the bags for your boys,what a good idea .. i am sure my kids would love something like these so i best not show them lol!